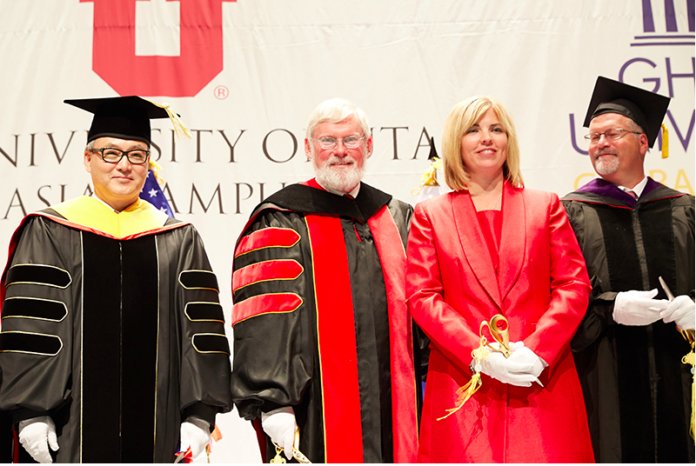 This spring, the first group of students from the University of Utah Asia Campus (UAC) graduated. The UAC began developing an abroad campus in 2014 as a part of the Incheon Global Campus which has been dubbed as the “best global education hub in Northeast Asia.” The organization also includes Belgium’s Ghent University, George Mason University, State University of New York, Stony Brook, and hosts about 10,000 students from all over the globe. The UAC parallels many of the University of Utah’s main campus assets, including academic advising, peer mentors, resident advisors, on-campus jobs, and student mental health counseling which focuses on helping study abroad students adjust to life in a new setting and balancing work, life, and school. Students attending the UAC are required to spend at least two semesters at the University of Utah main campus in Salt Lake City, allowing them to experience both cultures and an education in both the Korean and American system. The UAC offers several degrees including communication, psychology and social work, public health and will begin to offer degrees in film and media arts, urban ecology, and biomedical informatics starting Fall 2017. The U’s main campus welcomed the UAC students to Salt Lake in Fall 2016, and honored seven undergraduate and seven graduate students on May 4 at the John M. Huntsman Center in commencement. These students mark the beginning of an era for the university that aims to promote widespread knowledge and cross-cultural education. Oh works on campus in Salt Lake City, but her main job is to promote knowledge and excitement about the UAC and give presentations to various departments and student groups. By establishing a campus across the globe in an environment and culture that is severely contrasting to the one in Salt Lake City, the U has taken big steps in order to implement innovation and globalization for all students. The UAC also offers study abroad programs for current students attending the U. Cost for one of these programs also stays about the same as tuition for an education at the U, therefore allowing more students to obtain a unique and hugely gratifying learning experience. The Asia Campus has recently seen an influx of admissions, with over 225 in the Fall 2016 semester and an estimated 300+ arriving each year to the main campus to complete their undergraduate degrees. The UAC offers multiple scholarships based on merit, diversity, and need for Entrance Scholarships, as well as Leadership and Esteemed Scholar awards. The application deadline for Fall 2017 ended on Jan. 15, however, the UAC will start accepting enrollments for Spring 2018 later this year.